Recently both the UK and US governments have advocated the use of financial incentives to encourage healthier lifestyle choices but evidence for the cost-effectiveness of such interventions is lacking. Our aim was to perform a cost-effectiveness analysis (CEA) of a quasi-experimental trial, exploring the use of financial incentives to increase employee physical activity levels, from a healthcare and employer’s perspective. Employees used a 'loyalty card’ to objectively monitor their physical activity at work over 12 weeks. The Incentive Group (n=199) collected points and received rewards for minutes of physical activity completed. The No Incentive Group (n=207) self-monitored their physical activity only. Quality of life (QOL) and absenteeism were assessed at baseline and 6 months follow-up. QOL scores were also converted into productivity estimates using a validated algorithm. The additional costs of the Incentive Group were divided by the additional quality adjusted life years (QALYs) or productivity gained to calculate incremental cost effectiveness ratios (ICERs). Cost-effectiveness acceptability curves (CEACs) and population expected value of perfect information (EVPI) was used to characterize and value the uncertainty in our estimates. The Incentive Group performed more physical activity over 12 weeks and by 6 months had achieved greater gains in QOL and productivity, although these mean differences were not statistically significant. The ICERs were £2,900/QALY and £2,700 per percentage increase in overall employee productivity. Whilst the confidence intervals surrounding these ICERs were wide, CEACs showed a high chance of the intervention being cost-effective at low willingness-to-pay (WTP) thresholds. The Physical Activity Loyalty card (PAL) scheme is potentially cost-effective from both a healthcare and employer’s perspective but further research is warranted to reduce uncertainty in our results. It is based on a sustainable “business model” which should become more cost-effective as it is delivered to more participants and can be adapted to suit other health behaviors and settings. This comes at a time when both UK and US governments are encouraging business involvement in tackling public health challenges. On account of the associated morbidity from related chronic conditions, the current physical inactivity pandemic is placing a huge financial burden on healthcare systems . Estimated annual direct health-care costs related to physical inactivity for the UK are £0.9 billion  and including indirect costs, $251.11 billion in the USA . Public health interventions that improve levels of physical activity may thus improve health and wellbeing and combat rising healthcare costs. Due to pressure on healthcare budgets, these interventions must be cost-effective, with the potential for sustained behavior change through the implementation of large scale, long-term effective interventions. Recently both the UK and US governments have advocated the use of financial incentives to encourage healthier lifestyle choices [4, 5]. To date, financial incentives have been found to be most effective within the areas of substance abuse and smoking cessation [6–8]. Their use in improving physical activity levels has been less extensively investigated but a small number of studies exist, showing significant improvements in physical activity and/or participation in physical activity programs, using 'modest’ financial incentives [9–12]. However, irrespective of their behavioral focus there is a dearth of evidence on the cost-effectiveness of financial incentives for behavior change . Previous schemes have also tended to be very costly due to the ongoing cost of the monetary incentive given . For example, one smoking cessation program offered participants a total of $750 if they abstained from smoking for 12 months . In publicly funded healthcare systems such as the National Health Service in the UK, these schemes may be neither sustainable nor, in some people’s views, ethical because of their opportunity cost i.e. the loss of potential gain from other interventions not able to be funded. Therefore if financial incentive schemes are to be implemented in the long-term, they need to be based on a sustainable model. Much can be learned from the retail sector, which has long been successful at influencing sustained customer behaviors through various incentive schemes. For example, the loyalty or reward card market in the UK is one of the most prominent in the world . Loyalty card schemes are used to reward, and therefore encourage, repeated buying behavior by either entitling the customer to a discount on their goods or allocating them “points” from money spent which can be used to buy future goods or services. They are designed to attract and maintain customers through incentives and in turn influence long term, repeated behavior. It is contended that similar methods could be employed in public health to influence 'healthy’ sustainable behavior change . Further, by fostering links with local businesses, encouraged by the UK Public Health Responsibility Deal,  a sustainable model could be established by local businesses sponsoring financially incentivized public health programs. Indeed the UK Public Health Responsibility Deal was introduced in 2011 by the current UK government for the specific purpose of increasing business involvement in tackling public health challenges . The Physical Activity Loyalty (PAL) card scheme was a quasi-experimental study where employees from a workplace setting were each given a loyalty card to monitor their physical activity levels, by swiping their card at receivers placed along designated walking routes, within the grounds of their workplace. Participants were randomly allocated to either an Incentive or No Incentive group and both groups were able to obtain real-time feedback on their completed physical activity by logging onto the study website. However, for the Incentive Group, minutes of physical activity were also converted into points and these points could be redeemed for rewards sponsored by local businesses . The study found positive results for 'modest’ financial incentives on physical activity levels . The aim of this current study is to investigate the cost-effectiveness of the PAL study at increasing physical activity levels. A cost-effectiveness analysis (CEA) from both a healthcare and employer’s perspective will be performed with outcomes measured in quality adjusted life years (QALYs) and gains in productivity, respectively, to highlight the 'returns’ for both providers. The PAL study was a researcher blinded quasi-experimental trial. Participants were recruited from an office-based workplace and followed up over 6 months. Details of the study design, the intervention and its effectiveness on physical activity have been previously published . The study was approved by the School of Medicine, Dentistry and Biomedical Sciences Ethics Committee, Queen’s University Belfast, Northern Ireland. Employees working in two large buildings at Northern Ireland’s main government offices (which are set in over 300 acres of parkland) were recruited via email invitation, posters and a web link on relevant intranet sites. Eligibility criteria included those aged 16–65 yrs old, based at their office ≥4 days/week and ≥6 hours/day, and able to complete 15 minutes of moderate paced walking (self-reported). Interested participants were directed to the study website where they could access further information, register to participate and complete a screening questionnaire. Eligible participants then provided informed consent, were given a PAL card and asked to complete a baseline questionnaire . A computer-generated random allocation sequence was prepared by a statistician not involved in the administration of the trial and random assignments were placed in individually numbered, sealed envelopes by the statistician to ensure concealment of allocation. All eligible participants in Building A were randomly allocated (grouped by building to reduce contamination) to group 1: the Incentive Group and those in Building B were randomly allocated to group 2: the No Incentive Group. When undertaking physical activity during their working day over the 12 week intervention period, participants scanned their PAL card, containing a passive Radio Frequency Identification (RFID) tag, at Near-Field Communication (NFC) sensors positioned along walking routes and at the entrance to a gym and exercise studio, within the grounds of the workplace. The average distance between sensors was 643 meters (min 269 m, max 1017 m). Each time a participant swiped their card, a timestamp was created, recording the date and time of each swipe. The minutes between each timestamp were then aggregated, to give the total minutes of physical activity for each bout completed. Participants could obtain real-time feedback on various aspects of their physical activity, including minutes of physical activity, by logging into their personal account on the study website. A detailed explanation about the web-based technology used has been described elsewhere . Participants from both groups could use their PAL cards to self-monitor their physical activity levels at work. However, for the Incentive Group, minutes of physical activity were also converted into points (1 minute = 1 point; capped at 30 points per day) and these points could be redeemed for rewards (retail vouchers) at week 6 and 12. Additional file 1: Table S1 lists the rewards, their points’ value and corresponding monetary value. A marketing consultant was hired to act as an intermediary with the local business sector and was able to negotiate the provision of these vouchers 'in kind’ from local retailers. At baseline, age, gender, self-report height and weight, highest level of education, staff grade and self-report physical activity levels using the Global Physical Activity Questionnaire (GPAQ)  were recorded. For the purposes of this economic evaluation the main outcome measures of interest were objective physical activity (recorded using the PAL cards) which was recorded continuously over the 12 week intervention period, quality of life (QOL) (measured using the weighted health index from EQ-5D) at 6 months follow-up,  and self-reported work absenteeism within the past 6 months. Self-reported absenteeism data has been found to strongly correlate with recorded absenteeism data . EQ-5D is a standardized instrument used to measure health status . It comprises two parts- a descriptive system and a visual analogue scale. The descriptive system has five dimensions and each dimension has three levels. By using a formula which attaches weights to each of these levels a single summary health index is produced which can be used in economic evaluations to measure health benefits. In addition, EQ-5D scores were converted into productivity estimates using a recently developed algorithm . Since QOL can be an indication of someone’s degree of health or illness and different levels of health/illness lead to different levels of productivity then it has been suggested that QOL could be used as a proxy for productivity . Therefore, by utilizing studies demonstrating the relationship between QOL and productivity, researchers have developed an algorithm to translate changes in QOL into quantifiable changes in productivity [21, 23]. The algorithm combines two equations which predict an individual’s level of absenteeism and presenteeism, based on their EQ-5D scores, to give an overall productivity estimate between zero and one. At baseline, groups were compared using Independent Samples T tests and Chi-square tests. Statistical Package for Social Sciences (SPSS) version 17.0 Software for Windows (SPSS Inc, Chicago, USA) was used for data analysis. We used the previously reported ANCOVA analyses comparing differences between groups in minutes of physical activity at week 6 and 12 and self-reported work absenteeism at 6 months . For QOL and productivity we calculated the differences from baseline to 6 months for each group and used Independent Samples T tests to test if the mean differences between groups were significant. The aim was to present the incremental cost-effectiveness ratio (ICER) of the Incentive Group compared to the No Incentive Group by identifying the additional costs associated with the Incentive Group per additional unit of health outcome (QALY) or percentage gain in productivity. All costs and benefits accrued beyond one year should be discounted to reflect their present value but since our data were collected over 6 months, no discounting was required . All costs were derived in pounds sterling (£). The itemized costs for the PAL study are listed in Additional file 2: Table S2. The greatest expense common to both groups was that of the research fellow who was responsible for overseeing the PAL scheme. They were involved in the website design, created all content for its inclusion and delivered the swipe cards and vouchers. Of note, the management of participants through the trial was performed automatically by the website thereby reducing implementation costs. The additional costs accrued by the Incentive Group, and hence included in the ICER calculations, was due to the cost associated with the marketing consultant hired to negotiate the retail vouchers 'in kind’ and the cost of delivering the rewarded vouchers. EQ-5D scores for every participant at baseline and at 6 months were converted into individual utility scores using the EQ-5D scoring formula . By totaling individual utility gains over 6 months for each group and multiplying by 0.5 years, the total QALYs gained per group was determined. This allowed the difference in QALYs gained between the groups to be calculated. Finally, to calculate the ICER, the additional costs were divided by the additional QALYs gained by the Incentive Group. Individual EQ-5D scores at baseline and 6 months were also converted into estimated levels of productivity using a previously validated algorithm  and the total productivity gain over 6 months for each group was calculated. To calculate the ICER, from an employer’s perspective, the additional costs were divided by the additional gain in total employee productivity by the Incentive Group. We allowed all costs in the study to vary by +/- 5% except that of the research fellow, in which case, we employed the standard salary range that is typical for such a position. All itemized costs for each group were then selected at random from a triangular distribution, approximately 20,000 times, in a Monte Carlo simulation and aggregated. For the individual utility and productivity gains, we used bootstrapping to repeatedly sample individual gains . Cost-effectiveness acceptability curves (CEACs) were used to present the probability that the Incentive Group was cost-effective compared to the No Incentive Group, from both a healthcare and employer’s perspective, for a range of willingness-to-pay (WTP) thresholds. The WTP threshold represents the maximum amount a decision maker is willing to pay to obtain a unit of health outcome . Although the National Institute for Health and Care Excellence (NICE) in the UK eschews publishing a definite threshold, its past decisions imply a threshold of circa £30,000/QALY ($50,000/QALY) . Value of information analysis can be used to establish the value of additional evidence through further research or equivalently the expected costs of uncertainty for the healthcare sector . We used the Monte Carlo simulation outputs to estimate the individual expected value of perfect information (EVPI) by calculating the difference between the expected value of the decision made with perfect information and the decision made with current evidence. Population EVPI is calculated by multiplying individual EVPI by the total population who could potentially benefit from such a project by the number of years they would be expected to benefit . We chose a conservative assumption where we assumed the project to benefit all current Northern Ireland employees (695,000)  for one year and plotted population EVPI for various WTP thresholds. Population EVPI essentially represents the maximum amount of money any healthcare provider would be expected to invest in further research to eliminate uncertainty in the decision about whether the PAL scheme is cost-effective or not. This then allows for prioritization of research as the projects which are expected to achieve the greatest payoff in expected net benefit by obtaining further information can be pursued . 84% of employees in both groups completed the study at 6 months follow-up. Table 1 shows the baseline characteristics of the participants stratified by group. The mean age of participants was 43.32 ± 9.37 years (mean ±SD), 67% were female and 53% were categorized as having 'low’ physical activity levels at baseline. Independent Samples T test for normally distributed continuous variables. aChi-square test for discrete variables. Grade 5+ is the highest staff grade. At week 6 the Incentive Group performed more minutes of physical activity/week (26.18 mins; 95% CI 20.06, 32.29) than the No Incentive Group (24.00 mins; 95% CI 17.45, 30.54) but the difference was not significant (p=0.45). Similarly, at week 12 the Incentive Group performed more physical activity/week (17.52 mins; 95% CI 12.49, 22.56) than the No Incentive Group (16.63 mins; 95% CI 11.76, 21.51) but again the difference was not significant (p=0.59). From EQ-5D responses, the Incentive Group reported greater gains in utility at 6 months (0.03; 95% CI 0.01, 0.05) compared to the No Incentive Group (0.02; 95% CI 0.00, 0.04) although these were not significant (p=0.40). After converting EQ-5D scores into productivity estimates, employees in the Incentive Group improved their level of productivity over 6 months more (1.13%; 95% CI 0.34%, 1.92%) than the employees within the No Incentive Group (0.5%; 95% CI -0.39%, 1.39%) but the difference was not significant (p=0.30). Work absenteeism rates were not significantly different between groups at 6 months (p=0.22). Mean incremental costs, incremental effects and ICERs, from both a healthcare and employer’s perspective, are displayed in Table 2. The Incentive Group cost more than the No Incentive Group but it was also more effective resulting in a mean ICER of £2,900/QALY (95% CI -28,000, 32,000) and £2,700/percentage gain in productivity (95% CI -20,000, 30,000). QALYs, Quality adjusted life years. 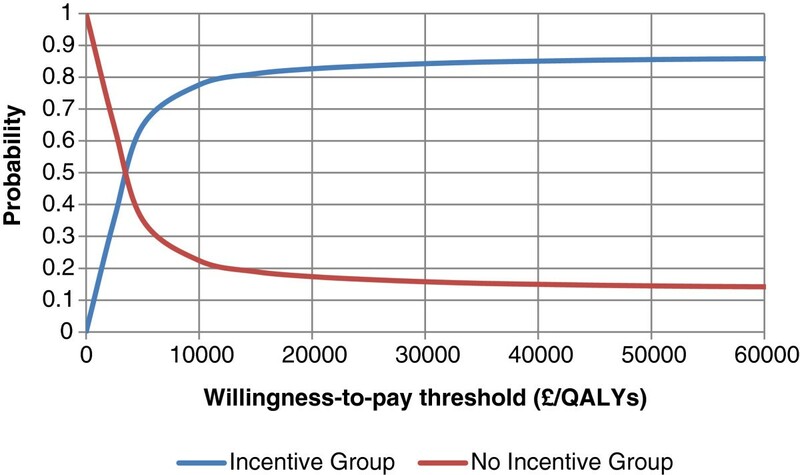 Figure 1 shows a CEAC showing that at the cost-effectiveness threshold of £30,000/QALY the probability that the Incentive Group is cost-effective compared to the No Incentive Group is greater than 85%. 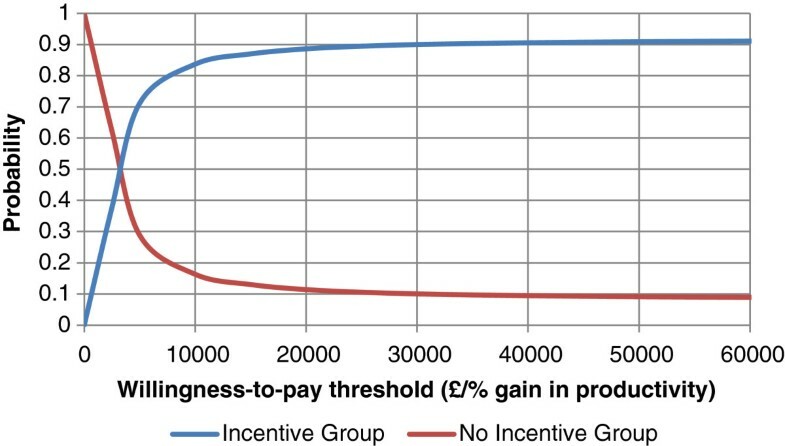 No cost-effectiveness threshold exists for the business sector but from the CEAC in Figure 2 we see that when an employer is willing to pay at least £4,000 per percentage increase in productivity the probability that the Incentive Group is cost-effective compared to the No Incentive Group is approximately 50%. Cost-effectiveness acceptability curves for QALYs gained for the Incentive and No Incentive Group. Cost-effectiveness acceptability curves for productivity gained for the Incentive and No Incentive Group. Figure 3 shows the EVPI for the Northern Ireland employee population which is very high (£ billions) even at low WTP thresholds. It continues to increase as the WTP threshold increases indicating that the increase in the monetary consequences of error exceed the reduction in probability of error as the WTP threshold increases. This result suggests that further research is warranted since the cost of further research would almost certainly be less than the EVPI at the £30,000/QALY WTP threshold. Population expected value of perfect information for the Northern Ireland employee population. The PAL scheme is an innovative physical activity loyalty card scheme for behavior change. By applying the techniques of cost-effectiveness analysis we found the intervention could be cost-effective at improving physical activity levels in predominantly inactive, office-based employees from a healthcare perspective. The ICER for the Incentive Group compared to the No Incentive Group was £2,900/QALY at 6 months which is well below the notional UK cost-effectiveness threshold. Therefore, whilst the additional QALYs gained by the Incentive Group was not statistically significant, this difference was enough to offset the additional costs of the Incentive Group as local businesses sponsored the rewards, keeping the additional costs low. However, the 95% CIs surrounding this ICER are wide alluding to uncertainty in its value but from our CEAC at the £30,000/QALY cost-effectiveness threshold, it had an 85% chance of being cost-effective. By calculating the population EVPI we were then able to quantify the uncertainty in this ICER. 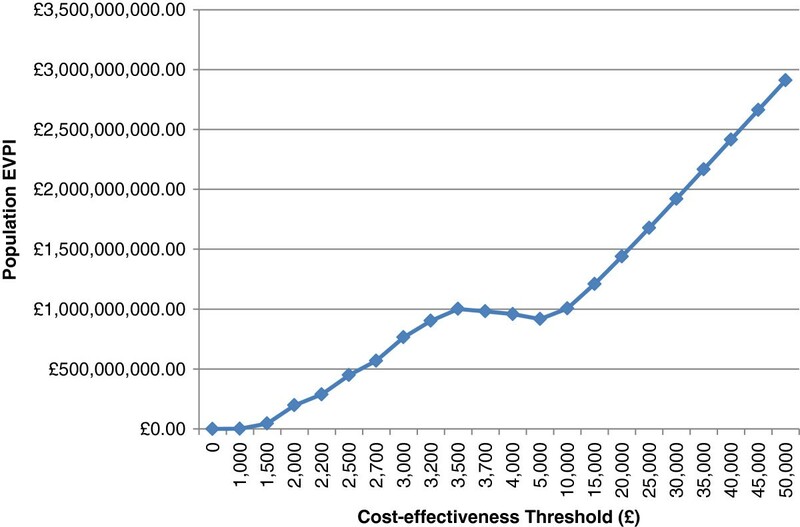 At the £30,000/QALY cost-effectiveness threshold the population EVPI was greater than £1.5 billion indicating that conducting further research would be cost-effective to decrease the uncertainty in our parameters, particularly our 'effect’ estimates. Indeed, a larger scale trial is currently being planned. However, our EVPI should be interpreted with caution since the standard approach to calculating EVPI requires a 'soft’ budget constraint and the assumption that health can continue to be purchased at a constant rate which can lead to an overestimated EVPI value . Therefore our EVPI may not necessarily represent the maximum amount a healthcare system would be willing to pay for further research but it is so much larger than the anticipated costs of further research that the case for further research still holds. From an employer’s perspective, the ICER was £2,700 per percentage increase in overall employee productivity which for different employers will have a different value depending on the size and success of their business. Essentially, if a business has revenue of at least £270,000 then the intervention will likely be cost-effective for them as they should get a return of at least equivalent to what they invested. These findings broadly accord with the assumptions of the SLOTH time-budget model which categorizes all 24 hours of the day into five domains: Sleep, Leisure, Occupation, Travel and Home . An employee’s decision about whether to exercise at work will depend upon the opportunity cost of their time taken out of their working day to exercise. This in turn depends upon what task they are displacing in order to exercise. If an employee has time during their lunch break to exercise then the opportunity cost may be lower than if they have to give up time spent working. Within the PAL study, we found the majority of participants chose to exercise between 12 noon and 2 pm i.e. during their lunch break. When employees are offered a financial incentive to do physical activity, as in the PAL scheme, their opportunity cost of doing exercise at work is decreased i.e. the incentive decreases the value employees place on their discretionary time at lunch, and they are effectively encouraged to perform exercise. A unique aspect of the loyalty card scheme, a financially incentivized physical activity program where rewards are sponsored from local businesses, is that it is based on a sustainable “business model” with a potential 'win-win’ situation for employers, local businesses and employees. In addition, this intervention should become more cost-effective as it is delivered to more participants as the intervention costs would increase minimally whilst the benefits would be much larger. These types of business partnerships used to promote physical activity support recent UK and US current government health initiatives, including the UK Public Health Responsibility Deal and the recently passed Patient Protection and Affordable Care Act in the US [4, 5]. If the business sector is to be involved in tackling public health challenges, then the issue arises as to who should pay for these interventions. In the workplace many employers are now accepting responsibility for the health and wellbeing of their staff as they realize the potential economic benefits of a healthier and more active workforce . Researchers have demonstrated that employees who have higher risk profiles are less productive at work, have higher rates of absenteeism and increased health care claims [35–40]. Therefore it has been suggested that since employers stand to benefit most economically from a healthier workforce, they should be prepared to pay for workplace health promotion programs. Increases in physical activity have been associated with concurrent increases in health-related QOL [41, 42]. For both groups we found small gains in utility, which using a previously validated algorithm could equate to small gains in productivity, with increasing physical activity levels. However, at baseline both groups started with high utility values of approximately 0.9. One of the issues associated with the EQ-5D utility index is that it cannot detect differences between health statuses at the high end of the utility range . Therefore, the small and non-significant gains in utility (and productivity) we found would be in keeping with our relatively healthy study population at baseline. For future economic evaluations a new “capability” approach, is currently being developed which should be more sensitive at measuring the effects of public health interventions . There is obviously a need for further research in this area as few studies investigating the cost-effectiveness of financial incentive programs exist. From CEAs of other workplace health promotion programs some valuable insights for improving the quality of future studies can be learned as many have been fraught with methodological limitations and accused of bias . A recent systematic review on the financial return of workplace health promotion programs found a lack of randomized study design, few explicitly stated the perspective of their analysis or properly measured and valued costs and benefits, not all studies performed an incremental analysis of costs and benefits, and few studies conducted sensitivity analyses or reported on the uncertainty surrounding their cost-effectiveness estimates . In addition, currently no 'gold standard’ guidelines exist to suggest what work related outcomes to measure and how, to incorporate them in a CEA. Therefore whilst our study addresses many of the above methodological limitations, it’s unclear if we should have measured productivity differently using a previously validated questionnaire such as the Productivity and Disease Questionnaire (PRODISQ)  or the World Health Organization Health and Work Performance Questionnaire (HPQ)  and possibly other work related outcomes such as employee turnover, improved employee satisfaction, and reduced accidents and injuries. When interpreting our CEA results it is important to highlight two main limitations. Firstly, a “do nothing” control group was not included in the PAL study and so we were unable to ascertain if just offering the opportunity to self monitor, as in the No Incentive Group, would have been cost effective on its own. However, evidence is available that 'self-monitoring’ is an effective technique for increasing physical activity levels [48, 49] and other studies of internet enabled health promotion have been shown to be cost effective [27, 50–53]. This might imply that our estimate of cost effectiveness for the Incentive Group is an underestimate of what it might have been if compared to a completely “do nothing” option. Secondly, we did not collect healthcare utilization data during our trial but since there was no significant difference found in absenteeism rates between our two groups, it is unlikely that healthcare costs would have been significantly different, especially over the short time frame of the study. By applying the traditional techniques of CEA we have demonstrated the potential for the PAL scheme to be cost-effective at improving adult physical activity levels and inducing greater gains in employee productivity and hence shown its economic value for both the health and employment sectors. However, further research is warranted to reduce the uncertainty surrounding our results. Of note, the PAL scheme is based on a sustainable “business model” which should become more cost-effective as it is delivered to more participants and can be adapted to suit other health behaviors and settings. This comes at a time when both UK and US governments are encouraging business involvement in tackling public health challenges. Health and work performance questionnaire. We thank Dr. Ann Zauber who reviewed the manuscript and advised on the statistical methods used. MD was funded through a HRB/HSC R&D/NCI Health Economics Fellowship. This research was supported by funding from the National Prevention 384 Research Initiative (NPRI) (grant number G0802045) and their funding partners (Alzheimer's 385 Research Trust; Alzheimer's Society; Biotechnology and Biological Sciences Research Council; 386 British Heart Foundation; Cancer Research UK; Chief Scientist Office, Scottish Government 387 Health Directorate; Department of Health; Diabetes UK; Economic and Social Research 388 Council; Engineering and Physical Sciences Research Council; Health and Social Care Research 389 and Development Division of the Public Health Agency (HSC R&D Division); Medical 390 Research Council; The Stroke Association; Welsh Assembly Government; and World Cancer 391 Research Fund (http://www.npri.org.uk), and the Department for Employment and Learning, 392 Northern Ireland (grant number M6003CPH). MD: Assimilated all necessary data from the PAL intervention, performed the cost-effectiveness analysis, interpreted the results and drafted the manuscript. RH: Conceived of the study, supplied all data required from the PAL intervention and helped to draft the manuscript. MT: Was involved in the study design and reviewed the manuscript multiple times. KC: Conducted the probabilistic sensitivity analyses, value of information analyses and gave advice on all other statistical analyses performed. FK: Instructed on the study methodology and reviewed the manuscript multiple times. All authors read and approved the final manuscript.